Finally, Part II in the Skeptics Handbook series – the bluster and bluff, the deceit, and the money. Enjoy & Share. It’s unthinkable. 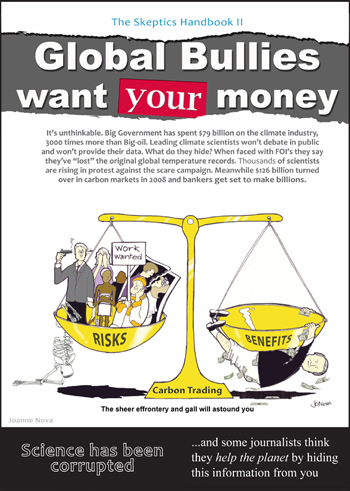 Big Government has spent $79 billion on the climate industry, 3000 times more than Big Oil. Leading climate scientists won’t debate in public and won’t provide their data. What do they hide? When faced with freedom-of-information requests they say they’ve “lost” the original global temperature records. Thousands of scientists are rising in protest against the scare campaign. Meanwhile $126 billion turned over in carbon markets in 2008 and bankers get set to make billions. The short synopsis of how we paid to find a crisis. Nine behaviours of the real deniers — there are lots of ways to deny the evidence. How carbon dioxide greens the world, why clouds dominate the climate, and if carbon didn’t cause the recent warming, what else might have? The short summary of the baseless hockey stick graph, with a devastating map of the vast array of peer reviewed information that demonstrates just how brazen the Hockey Stick “re-interpretation” of history was. How you can create a compelling crisis in a graph in six simple steps. Full color copies are being printed right now so that all Australian Senators and crucial people in the Australian Government can have this in their hands next week. They will be hand delivered by former politician, who is flying to Canberra specially to get the booklet into the hands of our decision makers. The Australian Senate is considering the legislation starting on Monday next week. It’s line-ball. The Leader of the Opposition wants to pass it, most of his party do not. Only seven members of the opposition need to vote for it for it to pass — and condemn Australia to decades of an unnecessary tax and an impost that will achieve nothing but banking profits. Thousands of copies will be printed in the next two weeks in Australia, and be distributed to journalists and other leaders. I welcome your feedback and ideas, especially this weekend before it goes to the printers. Also part of the team were the people who helped to cover costs of the website, software, printing and childcare. Merci. Without this help, I could not have produced this in time for the Australian Senate and Copenhagen and been able to offer it freely to the rest of the world. I am grateful. TURN THE PAGES OF THE HTML VERSION (Links will become active as pages are published). If you want one or more The Skeptics Handbooks to point at with friends, or to strategically give away, you can order them here for: Australian deliveries, and here for International Deliveries. Yesterday leak from the CRU and the secret e-mails tell us the agenda. Just follow the money. Page 2 Your reference to Aristotle seems obscure. Page 5 Stating “unless it was forced on them at the point of a gun” may not go down well. Australians generally don’t seem to accept that government gets its power from a gun and may suggest you are paranoid to state it. Maybe you should rephrase to just “unless their business would otherwise be shut down” or similar. Page 12 is excellent! So is most of the rest! Page 14 you imply Einstein wasn’t subject to peer review. Are you sure? Will read and comment but have to say your work on this is phenomenal and some day soon a heck of a lot of people will have reason to be very grateful to you, even if they might never know it. Page 12 typo: Paragraph 1: impressive has an extra ‘s’. Page 19, paragraph 4, you use Earth (describing the planet) without capitalizing it. Nice job. Just trying to point out some typos to help improve the product. Apparently the German journals almost never used peer review when Einstein published his early papers. After coming to the US, Einstein took offense when he got a critical review from Physical Review saying, in a letter to the editor, “We (Mr. Rosen and I) had sent you our manuscript for publication and had not authorized you to show it to specialists before it is printed.” This leads one to conclude that he hadn’t been subject to peer review before. The critique was correct, however. Einstein later discovered the error himself and changed the conclusion of the paper. This episode does illustrate the intended use of peer review — it is to discover typographical errors, mathematical mistakes (the error in Einstein’s paper), inadequate referencing of prior work (also a problem with Einstein’s paper, but not caught by the reviewer), and logical errors such as drawing conclusions not supported by the data or analysis. Before peer review it was the journal editor’s job to do this. As specialization increased, the editors began to rely on panels of specialists to help them. Is there any way I can download a higher resolution version of this booklet? Handbook persons:…thank you. Is there any way we over that big pond can get this into the hands of our loyal Senate persons? BobC – Thanks for the effort in answering my question on Einstein and peer review. I have only browsed the linked articles but these, and your comments, indicate that Einstein was in fact subject to peer review at least once in his career (even if he hadn’t wished it). And in that case the peer review was effective. Maybe Newton or Faraday is a better choice for the Handbook example. I hope this does not appear pedantic – I am anticipating objections on the usual inessential detail. EMail me if you wish more amplification of thoughts from me. Works for me. Nobody has debunked it if by debunking you mean argued against a thermometer reading at the same site being jotted down every day for four hundred years! Small typo, page 5 : You mean, “stealthily”. “By criticizing our theories we can let our theories die in our stead,” Karl Popper. NikFromNYC: Very interesting. Can you tell us where this daily thermometer reading has taken place? Another “Phenomenal” job. With 20 pages, I can understand there’s always a chance of mistakes. I have to go over an article a number of times before posting..Sometimes even seeing a authors mistake in spelling or spacing, I will correct it..We ARE Human, things happen! Thank you for your “Dedication” for it’s unmeasureable!!! P.10 “If the accountant for Enron said this, they would be jailed.” Misrelated singular noun and plural pronoun. Suggest “accountants” or replace “they” by “he’ or “he/she”. Similarly in the table on P.13. P.18 The graphs on P.18 invite an attack if only because the scale of the 2 graphs is not the same – and the cosmic ray scale on the lower graph will invite the criticism that it was changed to make the correlation look tighter. Also the adjustments in the early years are unexplained, and one can easily miss the “small print” explanation for adjustments in the lower graph. Might warrant a couple of lines in the text. I love page 15 which highlights that implementing the so-called precuationary principle is very far from being cost-free. Imagine that we developed-world humans are now proposing to earmark 100 billion Euros a year to fight a minor or possibly non-existent problem rather than to provide clean water, meet the Millenium goals etc etc. I would love to buy a few copies. Can you e-mail me so that we can make a suitable arrangement. Handbook II is very nice! Strong, entertaining, etc. However, you should revise now. It came right after Climategate – which should give you plenty of material for an even stronger Handbook II. A deadly Handbook, an IPCC killer! Both good, but Faraday is not as good as Albert E.
(3) one of the few scientific equations everybody knows is E=mc^2 (even if they do not know what it means)and they know he provided it. But his two relativity papers (one on Special R. and the other on General R.), and including his famous equation, were published in Nature without peer review. Perhaps the best examples are Aristotle, Newton and Einstein because they are the only scientists who each overturned the existing basis of physics? I’ll email you soon, maybe I can start with the spanish translation. Thanks for your wisdom. Newton and Faraday were indeed greats. For the moment I am calling on Galileo especially because he opposed authority, and was even placed under house arrest for the last 8 years of his life. In this fight we wage, “authority” has become the problem once again. Joanne: For the moment I am calling on Galileo especially because he opposed authority, …. This is especially appropriate because Galileo opposed a religious authority who knew he was right but feared an informed public would reject their authority. They had to keep the public ignorant of the best science available. The parallels with our present age are almost exact. The only real difference, is that that today’s priests of the environment cannot put us under house arrest for the rest of our lives. At least, not yet. I think I have taken on board the excellent comments online and offline. Apologies that I can’t fit all the suggestions in. I also rewrote the words on page 18 (Svensmark and solar cycles). And added in a “guns” very short explanation on page 5. Hopefully I’ve got all the typos! Amazing how many people can read a document and not see a word. Even after all these edits and reads, some errors were only seen by one person. I’d appreciate it if anyone has time to check esp pp 5, 10 and p18. Thanks! Because this site has caching, it may take a while to get the updated file (stored under the same name as the old file was). But where are the people who normally pick holes in all our ideas? I could use some of the regulars now. I want them to try and knock flaws in the new Handbook. I think WarmerGate (as it is becoming known) has scared them off… sigh, shame. Great job. Keep at it. “WarmerGate (as it is becoming known)”. And several other names, too. My favourite is CRUdGATE. are all within weeks before CoP15. Can they make a difference such that the wheels fall off the AGW bandwagon? Time will tell, but it seems that if they do not then nothing can. Just a couple of typos .. hopefully not too pedantic! … there are some messages that require no spin to make them look bad. There appears to be evidence here of attempts to prevent scientific data from being released, and even to destroy material that was subject to a freedom of information request. Worse still, some of the emails suggest efforts to prevent the publication of work by climate sceptics, or to keep it out of a report by the Intergovernmental Panel on Climate Change. I believe that the head of the unit, Phil Jones, should now resign. Some of the data discussed in the emails should be re-analysed. What is clear is that the proponents of the man-made global warming hypothesis have not sought to test their theories in the normal scientific way, they have sought to first of all marginalise and defund researchers who put forward a different view. They have hidden information, faked up data, used in their own words trickery, in an effort to hide the decline in global temperatures which is one of the inconvenient facts contradicting the predictions derived from their theories. These are not new developments. The so-called Medieval Warm Period (AD 800–1300), when polar ice melted to such a degree that the Vikings settled in Northern Greenland in areas now covered by ice, has been a huge problem for global cooling deniers – after all the Vikings didn’t drive north in 4×4 SUVs. A massive disinformation effort has been put in to rubbishing what is a well evidenced historic fact. The CRU is a taxpayer funded body which is now exposed as not fit for purpose, compromised by global warming advocates rather than staffed by truth pursuing scientists. It has funding largely from the British taxpayer and the EU. Until there is a clear out of the compromised personnel, not just CRU boss Phil Jones, funding should be halted. Taxpayers should be confident that their money is being used for scientific research, not to fund a cabal of global cooling deniers intent on creating a scientifically unfounded basis for a political project. The left likes to think their prejudices are based on science rather than mere opinions derived from political goals. The power of Marxist ideas from the nineteenth and twentieth centuries within the intelligentsia was because of the internal logic that claimed it was “scientific socialism” based on immutable laws of society. Twenty-first century anti-capitalism is trying the same trick, claiming an anti-capitalist mandate from climate science that just does not exist. It is no coincidence that the collapse of the worldwide communist project and ideals in the early 1990s coincided with the rise of the global green movement. Many of the enemies of capitalism have merely changed their flag from red to green. I am genuinely sad to see that you are making a mistake. Large numbers of people from the political left wing oppose the outrageous pseudo-science, moneymaking schemes of the AGW-movement. This is not a “left vs right” issue. On this issue the political left and the political right can finally join forces and cooperate to get the truth out and facilitate doing what is really best for all of us on this planet. It is right that certain high level AGW-proponents are also proponents of a world order similar to the rule of Stalin or Mao, just to name a few dictators who used the “communist” label. However, it is the same type of rule used by Pinochet, Idi Amin, Hitler, and more recently Saddam Hussein. None of those people pretended to be communists, but the rule was still the same. The people supporting or even proposing this path are speculants and big investors the like of Al Gore, George Soros, Rockefeller, Goldman Sachs, and a multitude of brand-name corporations, from Alcoa over Shell to Warner Bros.
Each and every single one of these individuals and companies are capitalist to the core. Certainly they are not altruistic in nature, and not communist at all, that should be evident for anyone. The particular dictatorship rule (or “new world order” in popular terms) that they are contemplating is the merger of government, finance and industry, as already practised in small scale (“bits ‘n pieces”) by President Obama of the USA. Look carefully and you will see. That particular merger is not a left wing ideology, it is not strictly a right wing ideology either. The proper term for that particular ideology is fascism. I know it has a bad ring to it, but the term “fascism” isn’t used here as a derogatory term, it’s just what it is. The clinical term, if you wish. The reason it sounds bad is just because it is bad, not because the term is bad. So, please put your fear of the left wing behind you. In the climate case the right and the left ought to be allies. On th sceptics side, of course. Even if you consider yourself to be “right wing”, the real danger comes from your right. As far out on the right as to have already left all the right wing ideals. The climate is nothing but a convenient vehicle or propaganda tool used to acommodate their goals. Had it not been climate it would have been terrrorism, pandemics, peak oil, or something else. Climate, however, has the sort of innocent altruistic appeal that makes it very hard for people to put aside their basic trust in everything good and start asking tough questions. So, as a result a lot of the left wing has been misled. The whole environmental movement has been all but nullified, zeroed out and rendered inactive now pursuing illusionist climate agendas in stead of real world sustainability issues. But, so has a lot of the right wing, especially people in business, finance and industry – as there are after all, massive amounts of money to be made on the scam, and everyone wants a share. To the detriment of the population and the globe as a whole. Regardless of political “side”, this makes me sad. We need to get this right together, and leave those cold war ghosts behind us, so that we can continue living in a free world where both “left” and “right” is still allowed. It’s rather urgent now. I’d have to disagree with you, John. AGW is a left-wingers dream. The Copenhagen Treaty is a test phase for a peverse type of global communism. John, George Soros is one of the richest men in the world, having made his billions on the capitalist money market. He is a socialist. Maurice Strong, influential UN powerbroker, is a billionaire too. Both espouse and promote socialist causes. You shouldn’t lump Hitler in with Idi Amin and Saddam Hussein. Hitler was – politically – on the left. His party was called the National Socialist Party. Google their manifesto; there’s nothing right wing about it. Mussolini grew up with a Marxist-Leninist father and started out in the Italian Communist Party. Both Hitler and Mussolini served in their respective armies in WW1 – Mussolini came out of it realizing that the Communist International ideal (i.e. that a labourer in Italy has more in common with his fellow labourers in, say, Mongolia, than he has with his boss or middle-class neighbour in Italy, whom he sees down the local cafe and whose children go to school with his children) was an illusion – hence the “National” flavour of both Italian Fascism and German National Socialism. Both these men fell out with the local “lefties” over the whole National/International issue – it was more a “sibling” strife rather than opposing ideologies. Mussolini coined the phrase “totalitarian” – the original meaning of which is “everything within the State, nothing outside the State, no-one left behind”. What does that sound like – Socialism or Conservatism? I recommend “Liberal Fascism” by Jonah Goldberg. It is quite the eye-opener. Hitler politically on the left? What a convenient interpretation AK from a typically one-eyed commentator. note I didn’t say he was on the right. Hello MattB, and I wasn’t talking to you, I was replying to John Smith. Or are you perhaps publishing under a pen name now? MattB the Greens voter calls other commentators one-eyed. Rich. There are many good people on the left, but not many of them are speaking out against the science-less scare campaign, while other environmental problems and humanitarian problems need our attention. For those few on the ‘left’ who are, all credit too them. If someone want’s to convince me this is not a right left thing, I need to see names or numbers. Most of the polls, and most of the politicians are lining up left-right/yes-no. Rumours that Hitler is from the far right are a fabrication by people on the left who don’t want to own his “success”. What a great job Joanne. I’ve downloaded all your pamphlets and will be printing and circulating them. On the Green-Nazi connection there quite some a history here. One of my favourite web sites dedicated to exploring the connections between fascism and environmentalism is How green is your Nazi quite academic and well worth exploring for those interested in exploring the shared origins of fascism (and the Nazi’s) and environmentalism. I recommend the post that I linked to but the whole site (which is nothing to do with me, btw) is worth exploring. The association between the American progressive movement in the early twentieth century, eugenics, some large American foundations, big US companies (such as IBM) and the holocaust is likewise well understood and explore at length in the work of Edwin Black, see for example “War Against The Weak”. This isn’t meant to be some random slur directed at the left. Global warming is every bit a pseudo science as eugenics was and is being used by the same social-political classes for exactly the same totalitarian, counter-enlightenment ends. Thank you for fighting. I wish I was a fraction as effective but you’ve motivated me to get off my A…. Jo Nova finds the Medieval Warm Period « Watts Up With That? There is a large version available now for those who want to print a copy. It’s 16Mb and it lives on the home page of The Skeptics Handbooks. Notice also there is a html version being fed out page by page. Great stuff Jo, and now we have a good man in Tony Abbott. The bedwetters are changing the sheets daily. Fantastic work Jo and thanks for posting and making downloadable. Have blogged and circulated as much as I can. However, Fascist governments opposed Marxism. Around the time of the Spanish Civil War, Marxists began to label all opposition to the “Right” of them as Fascist. This would include Democracies and democratic Republics. In my opinion, it is all a question of who has power, and whether that power is limited, authoritarian or totalitarian. Ms. Nova, the Handbook is great work. Thank you for putting it together in such an accessible way. I just wish I could hand a color hardcopy to my Senators and Representative. I compiled a CD of Professor Bob Carter, Interviews by various people [ here and overseas ] and especially the GRAND AGENDA in the primary file from a peer of the realm in England WHO has seen a draft of the agreement for world leaders. IT STRIPS THE WORLD OF THEIR CONSTITUTIONAL RIGHTS AND CREATES A WORLD GOVERNMENT BY THE RICH. Love the blog. I’ve been creating solar panels for small businesses for awhile now and doing pretty well… Lucky I found this place. I together with my guys appeared to be going through the best helpful tips on your web site and all of a sudden got an awful feeling I never expressed respect to the blog owner for those strategies. My guys are actually for that reason very interested to read all of them and have in effect clearly been having fun with these things. Many thanks for getting quite kind and then for figuring out this form of really good subjects millions of individuals are really desperate to know about. My personal sincere regret for not expressing appreciation to earlier.